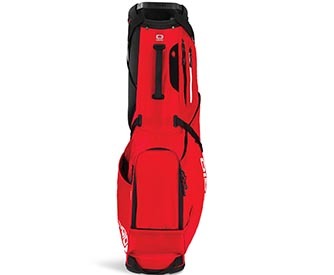 There’s a new-look Ogio in the golf space, and it has particular appeal for amateur golfers. A brand refresh built around redefined messaging, a new web site and a modernized logo also included a new line of products and two new styles of golf bags. Ogio has been a leading innovator of sports and travel bats, backpacks and golf bags for the past 30 years. The rebrand represents the company's strategic plan for growth and follows closely behind Ogio's 30th anniversary and acquisition by Callaway. Ogio’s newest Alpha collections prominently feature a new golf bag design. The company additionally launched the Shadow Fuse line of carry bags. Ogio describes the Shadow Fuse bag as so lightweight and mobile that “you won’t ever want to take it off your back.” The Fuse Collection redefines how high-performance lightweight materials and smart features can efficiently work together. Ogio put an intense focus on a custom fit, balanced weight distribution and adjustability, and offers the Shadow Fuse bag in a rainbow of colors. The details make a bag truly designed with the player in mind. Redesigned straps and a fit disc system improve weight distribution, balance and adjustability. The company engineered pockets and crucial carry-bag features in all the right places, specifically with the avid golfer in mind. There are five zippered pockets and a fleece-lined valuables pocket with a water-resistant zipper. Walking accessible stash pockets can hold a water bottle, cell phone and range finder. There’s even a retention loop for alignment sticks and a removable ball pocket panel. As part of Ogio's rebrand, Alpha is the first collection that the company has launched. Alpha products are built with premium components and materials, including Cordura® EcoMade fabric. This special material is ultra-durable and also made from recycled plastics, reducing the energy consumption in the manufacturing process. 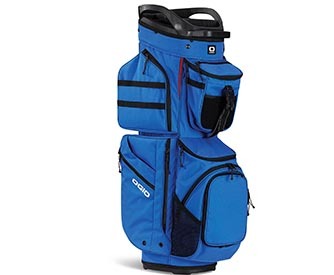 Ogio Alpha Convoy features a cohesive lineup of four backpacks, three travel bags, and two golf bags: the 514 Golf Cart Bag and 514 RTC Golf Cart Bag. The Alpha bags are built on the design pillars of organization, durability and sustainability. The bags feature 10 zippered pockets and two mesh stash pockets, plus insulated water bottle and cooler pockets complete with drainage ports. A 14-way top and an extra-large putter well will accommodate any club setup. Additionally, the fully loaded 514 RTC (Range-to-Cart) Bag has all the storage and organization of a cart bag but with a stand, and with hand selected materials, intuitive organization, and exceptional durability.